DURHAM: Vera N. Esper, 92, died Sunday, February 3, 2019, at Hillcrest Convalescent Center. She was born 8/12/26 in Utica, NY, the daughter of the late Hadley Herkimer Neff and Inez Finlayson Neff. 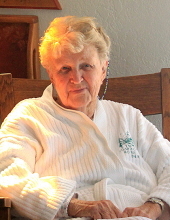 She graduated from UFA in 1944 and attended MVCC taking medical secretarial courses. She married George Esper on 5/30/49, he died on 4/16/96. For over 20 years Vera worked with her husband, who was a psychologist. Ms. Esper is survived by three daughters and their husbands; Debby & Brian Peterman, Seattle, WA; Pam and Rick Jaskot, Durham, NC; and Donna and Tony Lamendola, Pittsford, NY; six grandchildren, Emily, Lisa, Russell, Ryan, Mark and Maria. She also had 6 great grandchildren. She has a brother-in law, Richard Conover of Waterloo, NY. Vera was predeceased by three sisters, Shirley Castelli, Jean Shepard, and Marilyn Conover. She leaves behind many close friends, especially Irene Giotti. She was predeceased by an infant son. In lieu of flowers consider Our Saviour Lutheran Church 1640 Genesee Street Utica NY 13502 or St. Jude’s Hospital, 501 St. Jude Place, Memphis, TN 38105. A memorial service will be planned at a later date in Utica, NY. To send flowers or a remembrance gift to the family of Vera N. Esper, please visit our Tribute Store. "Email Address" would like to share the life celebration of Vera N. Esper. Click on the "link" to go to share a favorite memory or leave a condolence message for the family.